May 20, 2013 by Verle L. Bell, M.D. SO WHAT? God loves me to be practical with his word; for his purposes in giving me truth is that it might reprove me, fix me, and equip me for all of life. (Second Timothy 3:16) To the above “doctrine” God expects us to let go of materialism and ask, “what sort of people should I then be, living a godly life focused on eternity? When reading Bible stories, Iask what God’s point is in the story?- How should I then live? There is no other way to find salvation other than the name of Jesus. How should I then live? Without him I can do nothing. How should I then live? It is a privilege to be a fellow sufferer and soldier with Christ. How should I then live? My body is a temple of almighty God. How should I then live? I have been purchased by an infinite price, making me of infinite worth. How should I then live? This same Jesus will return again. Having this hope within me, how should I then live? The point is that ideas and doctrine and truth and facts are never to be observed with mere wonder and acknowledgement but by my asking, since this is true what should I do? 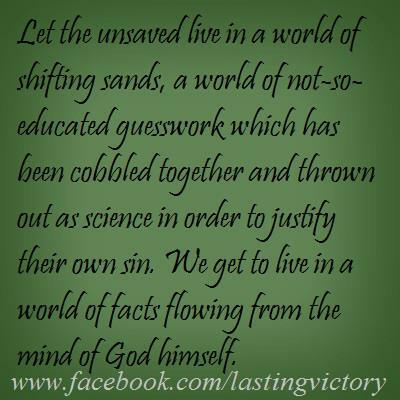 Let the unsaved live in a world of shifting sands, a world of not-so-educated guesswork which has been cobbled together and thrown out as science in order to justify their own sin. We get to live in a world of facts flowing from the mind of God himself. What a privilege, how secure I should then be knowing that when I do things his way I will never be ashamed. If I am living in this truly sane way, living by truth applied, then even other Christians should think that I am going overboard. To most it seems radical to take every thought into captivity, to acknowledge God in all my ways, to talk to him without ceasing, to give him thanks constantly and to apply each of his ideas to my life in a practical way. DEAR LORD, AS USUAL, YOUR WAYS ARE IMPOSSIBLE AND YET SO PRACTICAL, THE ONLY REAL WAY TO BE HAPPY IS TO BE POSSESSED BY YOUR HOLY SPIRIT AND TO LIVE THE LIFE IN THE FLESH BY HIS POWER. HELP ME TO GROW IN THE PERCENT OF THE TIME I AM RATIONAL AS EVIDENCED BY TALKING TO YOU AND SEEKING TO APPLY YOUR WISDOM HIDDEN IN EVERY VERSE. This entry was posted in Uncategorized and tagged ATTITUDES of peace and power, Christianity, educated guesswork, fellow sufferer, Life, second timothy. Bookmark the permalink.